Consumption of rice in Japan has been decreasing since 1962 due to changes in dietary habits. On the other hand, the needs for rice is diversifying year by year. In the field of rice research, we aim to raise consumption of rice by responding to diversifying needs and to produce stable paddy rice domestically. We aim to improve rice cultivar leadership and technology development by our four research units focusing on breeding, physiology, quality, and applied genomics research, respectively. In the 'Rice Breeding Unit', we are promoting cultivation with high yield and superior characteristics, mainly for business / processing varieties where demand is growing recently, and feed varieties leading to an improvement in food self-sufficiency rate. In the 'Rice Physiology Unit', we clarify factors to realize high yield, develop cultivation methods to enhance yield-ability and quality, and 'Rice Quality Unit' will expand the use of rice such as rice flour bread and Japanese confectionery. We are developing the evaluation method and processing method of rice with the new characteristics. 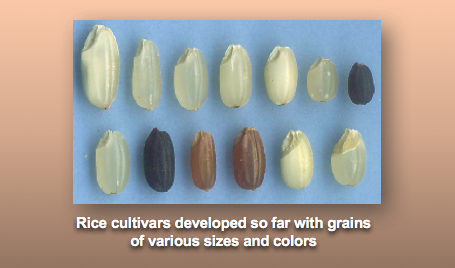 In addition, in the 'Rice Applied Genomics Research Unit', we are developing technology such as elucidation of the function of useful genes by rice genome information, development of DNA markers for identifying useful characteristics in order to improve the efficiency of breed improvement that takes time and labor. These four units are working closely with each other to efficiently advance the target breed improvement and technology development.